You’re looking for a better fit. You’re ready to explore careers with a college that will guide and connect you. Mitchell College is ready to help with our Seamless Transfer Experience… getting you where you want to go faster and more smoothly. Even before you get to campus, you’ll meet with your Transfer Advisor who, as part of a campus-wide team, will get to know you and get you connected fast! Interested in chorus, theater, dance? We’ll introduce you to the performing arts faculty, staff and students who will be your instant community on and off the stage. Transferring to Mitchell for Division III athletics or to play intramurals/club sports? The ball is in our court. We’ll personally introduce you to coaches, other athletes and club leaders who build winning teams and experiences that connect players and friends. Looking for a welcoming community and fun social vibe? Your Transfer Advisor will get to know your interests and guide you to campus clubs and activities that fit. At Mitchell, you’ll find a diverse and vibrant community that truly cares for each other. You’re ready to get on the fast track to getting a degree and Mitchell has one of the fastest tracks out there. Our cutting-edge Core & Explore model cuts to the chase, helping you to build foundational “core” knowledge in an area and giving you plenty of room to explore how to apply that knowledge to areas of concentration that interest you. You’ll work one-on-one with your Advisor to craft a degree program that is engaging and fueled by your passion and interests. Plus, with our unique pacing model, you can speed things up — as you’re ready— by adding in 1, 2 or 3 MiniMester sessions each year. Transferring as sophomore, you’ll get the full benefit of our career immersion program. We’ll help you cultivate a compelling résumé, practice interviewing skills, then get you behind the scenes on tours and job shadows so you can build confidence over time. As a junior or senior, you’ll work one-on-one with our career specialists to craft career experiences that are just right for you! You’ll have the opportunity to apply your learning with assurance at an on-campus career lab or snag an awesome internship with one of Mitchell’s 50 professional partners in the region. 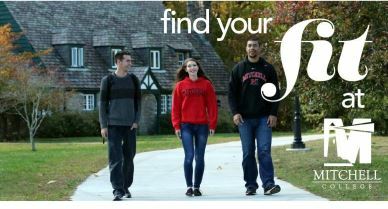 Contact admissions@mitchell.edu to connect with a Mitchell transfer counselor. Apply Today and Find Out in 3 Weeks! Mitchell College follows a rolling admission policy. Apply today through the Unique Minds Application or the Common Application and you’ll find out in just a few weeks. Submission of SAT and/or ACT scores is optional.